As I listened it dawned on me that while sometimes we may not try hard enough, sometimes it may be that we simply try too hard. At times the fact that we try so hard to make something happen or to change someone’s opinion may be the very thing that is keeping from us what we want. There are moments when all of our pushing and effort toward a particular outcome makes it less likely that we’ll actually reach our goals. So maybe all we need to do at those times is to show up. To resist our temptation to push and force an outcome, and simply be with what is, what’s going on, and how others are coming into our life. Maybe we need to let everything flow as it’s supposed to. What if instead of being driven to fight against the obstacles in our way, we simply show up and observe what happens? What could be possible then? There are certainly times when we need to increase our effort, and there are at least as many times when those of us who normally operate in overdrive need to let go and let things be. Our job is to figure out when it’s a time for effort and when it’s a time for just showing up and breathing. Show up, don’t try, and see what happens. Where in your life might you be trying too hard? 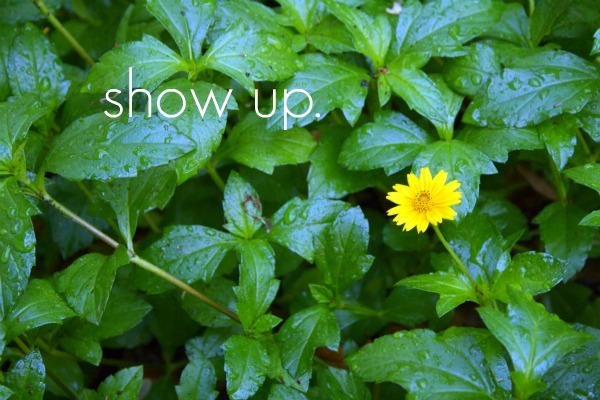 Where would you benefit from simply showing up for what is? For a complimentary 30-minute session to see how coaching could help you benefit from simply showing up, contact Robyn at rmcleod@chatsworthconsulting.com.